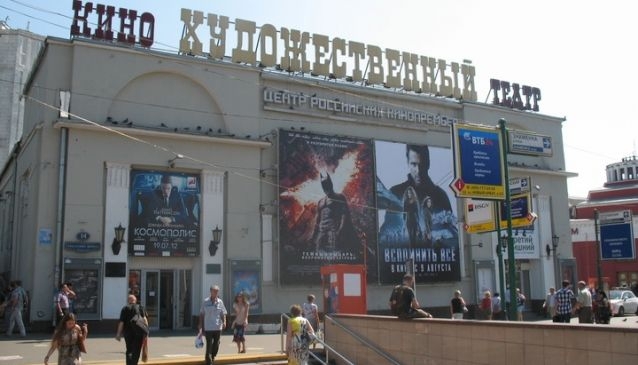 Khudozhestvennyi is one of the oldest cinema theatres in Moscow which is over 100 years old. It is located right in the city centre near Arbatskaya metro station. Now it's a cinema club where Moscovites can learn English language by watching English movies and come to see European films in the original at various festivals which take place there all year round. It has a big hall (609 seats), a minor hall (50 seats) for documentaries and non-commercial movies, the blue one for art house films (50 seats), the green hall (37 seats with nice padded stools) and the 3D gold one for animation (22 seats). Recently they have introduced 3D opera film Aida by Verdi, there are also records of the world famous operas to watch at special opera sessions. It has an excellent sound system, is air conditioned and comfortable to have a good edutainment time. Besides, classical interior and Soviet architecture are interesting to see in combination with modern facilities and decorations.